Online news had quite the 2017, attributable in part to the frantic news cycles of President Trump's first year in administration, as well as the "fake news" crisis. In the midst of all this, Americans increasingly looked to online sources of news as their main providers. While Pew Research Center data from August 2017 showed 50 percent of Americans often got their news from TV and 43 percent often became informed online, the resulting 7-point gap stood in stark contrast to the 19-point gap observed in early 2016. Perhaps online news is even helping to revive the journalism industry. A Late 2017 Poynter Media Trust Survey measured the highest uptick in media confidence since Sept. 11, 2001. As online news becomes mainstream, Americans are more willing than ever to pay for their news through digital subscriptions, which has opened new doors of opportunity for publishers moving forward. Monetization of online content has been a tricky challenge for news outlets, even with tools like paywalls available. Many consumers simply won't pay for news given the relative availability of free options, but that attitude is starting to give ground in the U.S.
Oxford University's Reuters Institute for the Study of Journalism found in 2017 that the number of U.S. news consumers who paid for content in some way nearly doubled from 2016. 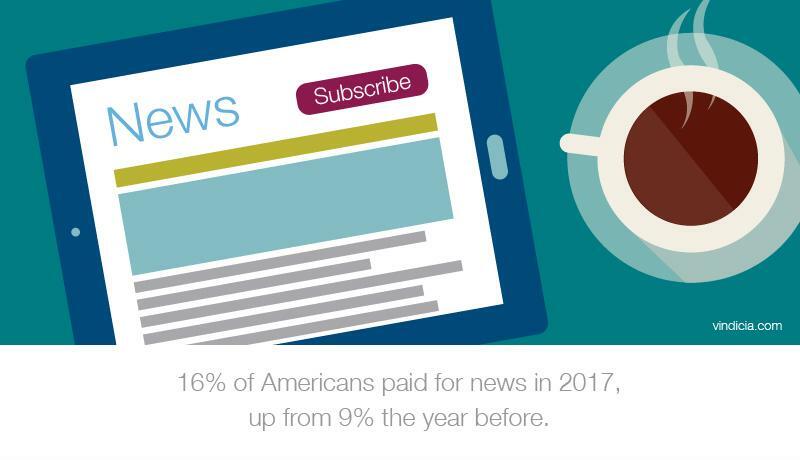 In the Reuters Institute's "Digital News Report 2017," 16 percent of American survey respondents said they paid for news in some way (8 percent maintained a subscription while 8 percent made at least a one-time contribution). That share is well up from the 9 percent seen just a year before. Though the U.S. isn't yet on the level of Nordic countries (in Norway, 15 percent had a subscription and 11 percent made a one-time payment), it was the only country to register a major increase in willingness to pay. The growth is encouraging for publishers, especially as it pertains to key customer demographics. Amazingly, a big part of this news consumption has been driven by young consumers. In 2016, 4 percent of Americans age 18-24 paid for news, as did 8 percent of those 25-34. Those numbers, after lagging for much time, exploded upward in 2017 to reach 18 percent and 20 percent, respectively. So what changed? Of the 36 countries surveyed by the Reuters Institute, the U.S. had the highest proportion of respondents saying they paid for news because they wanted to fund journalism (29 percent). Indeed, many of the publications at the front of investigative journalism, breaking news and political commentary have seen groundswells of support among young Americans. Politico reported that The New Yorker saw a year-over-year increase in subscribers from the 18-34 cohort of 129 percent in 2017. Similarly, The Atlantic's combined print and digital subscriptions held by consumers ages 18-24 climbed 130 percent in the same time, compared to 70 percent growth for ages 18-44. Consumers are opening their wallets for breaking news. Cornerstone newspapers like The New York Times, The Washington Post and The Wall Street Journal have all seen subscriber growth, both in general and with young consumers. The Times told Politico its online reach with millennials was up 9 percent in 2017. Meanwhile, The Post surpassed 1 million subscriptions in September 2017, CNN reported, placing it behind The Journal with 1.27 million at the time. The Times has seen considerable growth, with digital-only subscriptions reaching 2.6 million in February 2018, a figure that allowed the paper to surpass $1 billion in overall subscription revenue for 2017 (digital-only grew 49 on the year). A key question raised by Politico is also on the minds of many in the industry: What makes millennials so willing to pay for online news? The answer can in part be seen by the range of subscriptions such consumers manage and engage with on a daily basis, whether for entertainment or things like meal kits and boxes of curated clothing. As Politico said, millenials are willing to pay for quality, and when a cause like supporting journalism is in play as well, the growth in digital subscriptions starts to make more sense. 30 percent pointed to smartphone and tablet access. 29 percent wanted to read from diverse sources. 23 percent were given a good offer. 17 percent had a favorite source that didn't allow free reading. 16 percent highlighted member benefits other than access. Online news consumers are also willing to pay for a variety of products. When asked what type of news most motivated them to buy, 41 percent said breaking news, 38 percent said reporting on recent events, 34 percent said in-depth analysis and 29 percent said commentary. Publishers are also targeting creating a more immersive experience for subscribers. Axios recently reported that names like The Times and The Post are teaming up with Google to serve their articles directly to subscribers and enable payments through Google. The market is teeming with opportunity for subscription businesses that report news and offer other types of content. Yet it's crucial these publishers understand that managing and profiting from digital-only subscriptions requires strict attention to the principles that guide the subscription lifecycle for any other company. Take it from the The Times, which credited retention efforts as being a factor behind their target-beating revenue numbers. "We've continued to make encouraging progress and are seeing far lower monthly churn than a few years ago," Mark Thompson, chief executive, said during an earnings call. News providers must also fine-tune their approach with robust tools that allow them to serve offers to encourage sign ups, as well as offer freemium access that allows for a set number of free articles a month before a full paywall is enforced. When looking for these capabilities and refined experience from a subscription partner, publishers can look to Vindicia. As the Subscription People, we have years of data to inform how best to craft your strategy and help drive business. Contact us today.